Looking for an authentic Greek cuisine in Athens? Ydria Cafe is your place to be in. Come here and try out some of its most delicious Greek dishes that you have ever done. More so, the placant staff makes sure that you get only the best that the city has to offer. For family eatings, there is a separate space that is dedicated to boost the atmosphere. 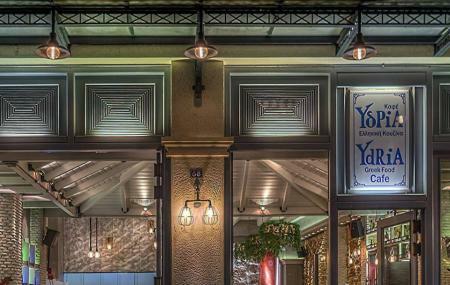 Comfortable, vibrant and light on pockets, Ydria Cafe makes up for a great evening and more than few fun chats. How popular is Ydria Cafe - Restaurant? People normally club together Greek Parliament and Thision Open Air Cinema while planning their visit to Ydria Cafe - Restaurant. Great stuff, they are willing to make you comfortable, delicious food. Loved spending time there, they bring sweet wine shots on the house when you ask for check. The fish was really delicious. Definitely I would recommend it. Good wine with great service and atmosphere in the garden area. The food was barely average. Chicken was cold and did not taste good. Starters was simple and also nothing special. the portions were enormous but that was not the only reason why we hasnt finished our dishes. Lovely outdoor seating area. Good service and lovely food. Went for lunch and the feta with tomatoes and peppers was delicious. Great milkshakes too! Had a great midday meal here. We had just been walking by and struck up a conversation with the owner, who had great customer service. Great service by the waiters as well. The ambiance of the outdoor seating was great. Lots of vegetarian options. Would definitely return. Pretty quaint place with lots of outdoor seating. Wonderful staff and the food was delicious. Beer could use a bit more style selection but definitely wouldn't knock a restaurant owner for sticking with the basics in a tourist destination.